by Daniel Greenfield: Is there anyone Bill Clinton wouldn't take money from? The jury is out on that one. 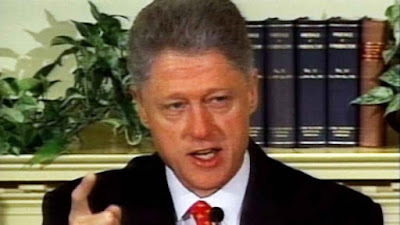 And I do mean a jury, rather than a Sharia court.Former President Bill Clinton collected $5.6 million in fees from GEMS Education, a Dubai-based company that teaches Sharia Law through its network of more than 100 schools in the Middle East, Asia and Africa, according to a Daily Caller News Foundation investigation. The former president served as honorary chairman for GEMS Education from 2011 to 2014, according to federal tax returns he filed with his wife, 2016 Democratic presidential nominee Hillary Clinton.The company is incorporated in the Caymans which is a whole other red flag, but the Clintons probably have plenty of money socked away in the area as well. Digging deeper, The Daily Caller finds all sorts of issues with the complex financial networks involved, but really this is business as usual for the Clintons who are unimaginably greedy, have no self control and have a long history of being willing to take money from anyone, whether it's international fugitives or theocrats. Daniel Greenfield is Shillman Journalism Fellow at the David Horowitz Freedom Center and a New York writer focusing on radical Islam. David Horowitz is a Contributing Author of the ARRA News Service. Tags: Bill Clinton, Clinton Foundation, Hillary Clinton, Investigative Group, Islamic terrorism, muslim jihad, Sharia Finance, Daniel Greenfield, FrontPage Mag To share or post to your site, click on "Post Link". Please mention / link to the ARRA News Service. and "Like" Facebook Page - Thanks!